I love rich, hearty, almost stewy soups, without meat of course. I’m talking about the ones you could enjoy with a piece of crusty bread and some red wine on a cold day. This lentil soup is like that. Lots of vegetables, some hot chili and green spices. Lentil is a core vegetarian ingredient in my view. Rich in fibre, folate, iron and magnesium, which are important contributors to heart health. 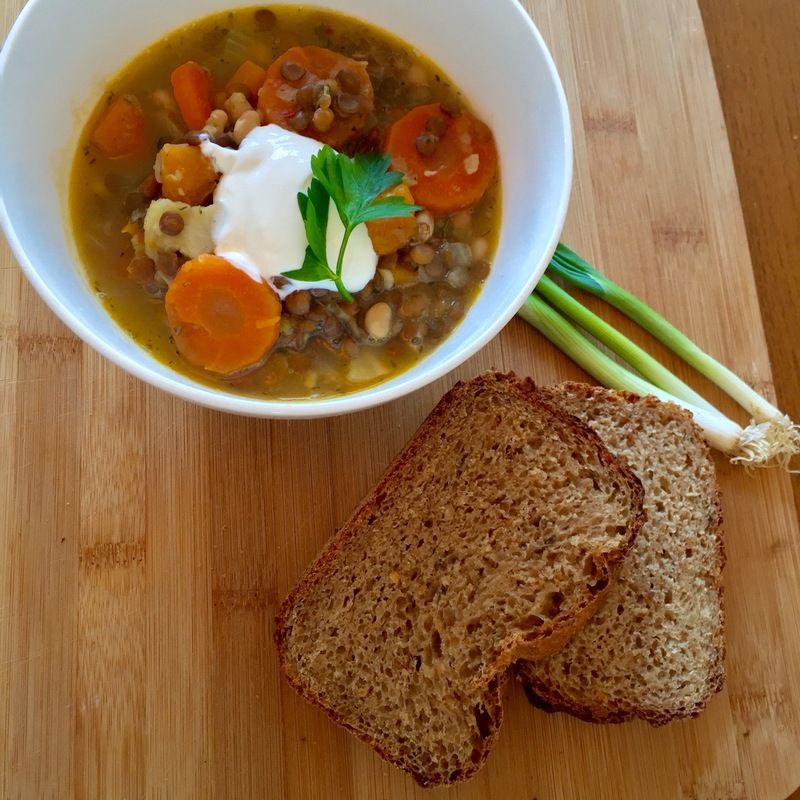 Great protein source: 26% of lentil’s calories are attributed to protein. And that’s just the main ingredient! The good thing about a one pot dish is, that basically all you need to do is chop everything and let them cook on the hob. There’s a bit of a chopping involved, however after that, you can sit and rest until it’s ready. Takes a bit more than an hour in total and you can feed around 4-5 people with the measurements given below. My son loves it too. In a big casserole pan heat the oil and add all the vegetables, you’ve been chopping in the last 15 minutes 🙂 plus the spices. Let them cook for 15 minutes, keep stirring. Add the stock, bring it to boil and cook until the carrots are cooked half way through, about 20 minutes. Then add the lentil and the bean. Cook for another 20-25 minutes. When it’s ready, serve it with bread or baguette and you can add some sour cream too. Enjoy.